Our sponsor, Instant Pot, gave us the opportunity to play and revel in this fantastic new electric pressure cooker. This beauty does it all: 7-in-1 Multi-Functional Cooker: Pressure cooker, slow cooker, rice cooker/porridge maker, steamer, sauté/browning, yogurt maker and warmer. I had been researching and seriously considering buying one around the holidays. I had been following their Instant Pot Community on Facebook, and amazing things were happening in kitchens around the world. I have made a cheesecake in the Instant Pot. It may have been the best cheesecake I have ever made. I have cooked rice at the snap of my fingers. I could go on forever about the eggs that practically peel themselves and the “poached” eggs I have made in this life-changing electric pressure cooker. I cooked a fork-tender brisket in about 1.5 hours. It takes over 4 hours in the oven. Ha! I saw that eyeroll!! You're thinking "She said this Instant Pot is life-changing". I think you will agree, once you see the fantastic recipes on our 37 Cooks blog. I'm back! I just jumped up to put some eggs in to make deviled eggs for lunch. Like many, I worried initially that this pressure cooker would blow up all over my kitchen and damage me in the process. It didn't take me long to realize that was not going to happen. The Instant Pot is very user friendly. It comes with clear instructions and sample recipes to try. I glean most of my info and recipes from the IP Community on Facebook. With over 52,000 members, there is a wealth of information, people ready to help and more recipes available than I will ever be able to make in one lifetime. I decided on flan because I have never made it before. I made one as a test dish and the caramel was a tiny bit burnt so this time I kept the burner heat a little lower. My test subjects loved the trial run, burnt caramel and all. They couldn't believe that I made it in the Instant Pot! My second flan, for this challenge, was spot on. Smooth, extra hit of vanilla and a perfect caramel sauce. Give the Instant Pot a try and join the rest of us who continue to be amazed by it’s capabilities. I used a 7” soufflé container. Make sure whatever you choose, has a solid bottom. To make the custard, add the eggs to a bowl and whisk. Add the sugar and mix well. Add the milk and vanilla and whisk together. This will be poured over the caramel when it is ready. 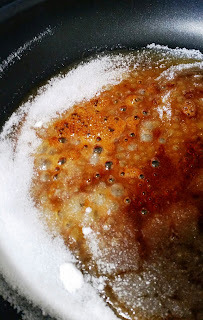 Make the caramel in your widest sauté pan. Add the sugar and turn the heat to medium-high and wait (I have an electric stove. The first time I made the caramel I burned it because the heat was too high. What works best for me is a burner setting of 7, sometimes lowering to 6). One rule for making caramel is don't stir it. Don't pick up that spoon! If you must, and I did, swirl the sugar around the pan. Once almost all of the sugar has melted and caramelized, remove pan from the heat. 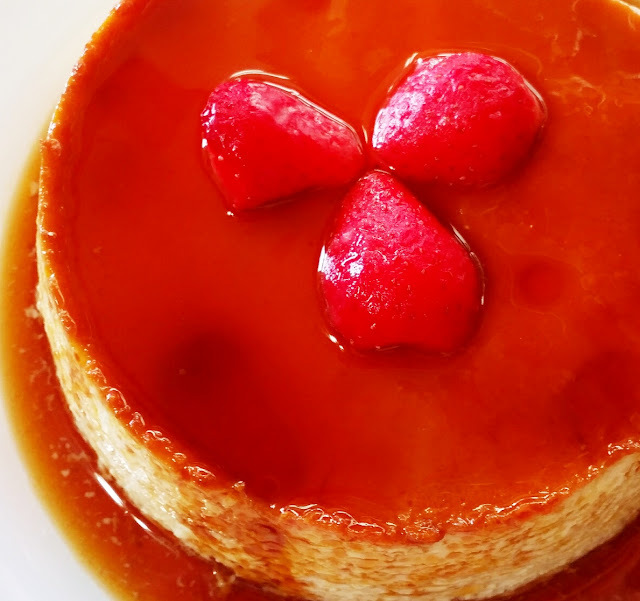 Pour the caramel into the flan dish. Pour the egg milk mixture over the caramel. Don't overfill - leave at least 1” from the top of the container. Add 1 cup of water into the liner pot of the pressure cooker. Lay trivet in bottom of liner and place flan container on trivet. It is important that the flan dish be on a trivet (the Instant Pot comes with a trivet). Cover flan dish lightly with foil. Lock the lid into place and make sure the vent is in sealed position. Set the manual pressure to high and set time for 10 minutes. After 10 minutes, the Instant Pot will beep several times. Don't do anything yet. Allow the pressure to release naturally. After 10 minutes, open the pressure valve to release any remaining pressure. Remove the lid and carefully remove the flan container. Cool for 1 hour and then cover with plastic and refrigerate for at least 3 hours. When ready to serve, set the bottom of the flan dish, in a dish of very warm water, for about 1 minute. 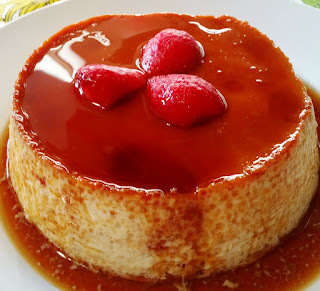 Use a knife to go around the sides of the flan to release from the side of the container. Place your serving dish on top of the container and flip it over and voila! You're a pro! You just made tasty flan in the Instant Pot electric pressure cooker.